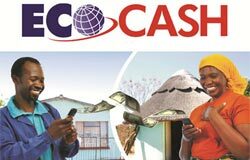 Less than a month ago, Econet announced that it had connected a million subscribers on its mobile money platform, Ecocash. Yesterday, a Twitter update by the CEO of Pattern Matched, Markus Schorn, revealed that Econet has since signed on an additional 200,000 subscribers to the mobile money service since the March announcement . Pattern Matched is the supplier of the technology powering EcoCash. well done Ecocash and Econet on going past 1,2 million clients today! Even more interesting are the updates on Schorn’s Twitter feed which show how the service has grown since it launched back in September 2011. We got the figures from some of the updates and created this graph to illustrate the growth since launch. You’ll notice the growth has been more or less constant since around November. From the updates we managed to see that’s at least 200,000 users each month since December. Some months had significantly more; the 25 January to 24 February period for example saw 269,000 users signing up for the service. Ecocash 320 000 registered users andy 18 000 anonymous other network users!! 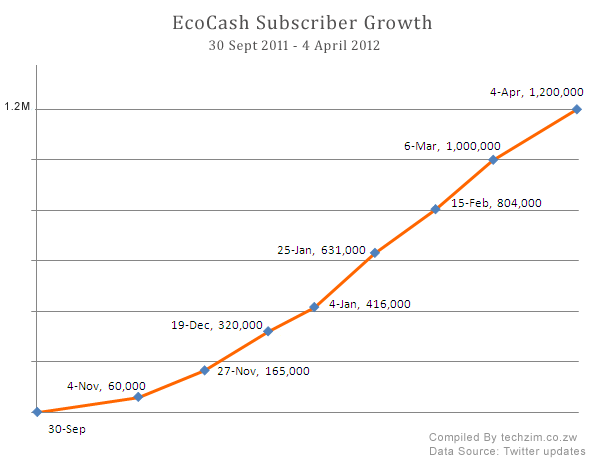 Ecocash is now well over 1,5 million subscribers and growing! What happened to Ecolife ?